Thank you Cedrick for that introduction. I’m very happy to be at the 29th Jackson County Trade Show today. Before I get started, I would like to acknowledge our local City and County officials here supporting this trade show today. Thank you for your attendance and support of our local businesses – large and small. 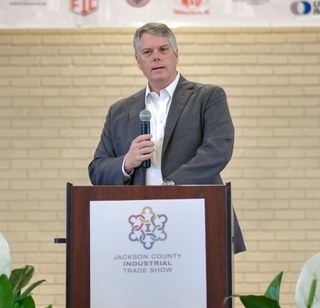 I also want to thank the Jackson County Chamber of Commerce and the Industrial Suppliers Association for putting together this great event that showcases the diversity of businesses operating in Jackson County. But more importantly, I’d like to thank all the business leaders here for supporting this trade show. Events like this are important in areas like Jackson County that are home to great local businesses. This event gives local vendors a fantastic opportunity to promote their goods and services in a face-to-face environment with other local businesses and industries. It also provides great networking opportunities that allow community leaders from all walks of life to learn what great opportunities exist within Jackson County. I have a great story to share with you today…one I am proud to deliver in this event. It is a very exciting time for our industry…a time of great opportunity for South Mississippi. Shipyards are only as good as their people, their facilities, and their vendor base. We need, and are fortunate to have, a strong local vendor base…you play a key role is our successes. Late last year, President Trump signed the Fiscal Year 2018 National Defense Authorization Act into law. This action included a change in U.S. policy and was spearheaded by Mississippi Senator Roger Wicker and Virginia Congressman Rob Wittman. The change, known as the SHIPS Act, calls for a Navy battle force of 355-ships. The good news for Mississippi, for Jackson County, and for Pascagoula is that Ingalls is building the three most important classes of non-nuclear ships that the Navy will need in larger numbers to meet that 355-ship goal that is now the law of the land. And with the support of our local and state governing bodies, we are ready now to meet this requirement without delay! 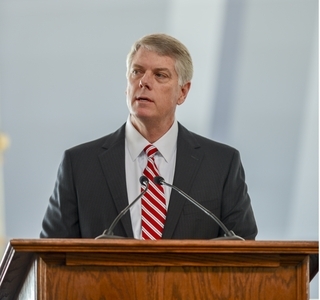 With the support of our great government and business partners here in Jackson County and in Mississippi, we’re re-invigorating the shipyard of the future with hundreds of millions of dollars of investments in manufacturing process modernizations and infrastructure improvements – all designed to improve our efficiency and the affordability of the ships we build. As is the case with any major employer, our successes are not ours alone. We are America’s premier shipyard in part because of the local businesses that have stood with Ingalls since the beginning through strong times and tough times – our local business partners. Ingalls buys resources and equipment from companies located in every state of our nation. But our first goal is to shop at home. In 2017 alone, Ingalls spent $160.9 million on goods and services procured from 143 suppliers in 17 counties. Of that, $76.8 million was paid to 71 active suppliers in Jackson County. And, if we drill down one more step, $53.1 million of that total was paid to 41 active suppliers right here in Pascagoula. We take our relationship with our local communities seriously. 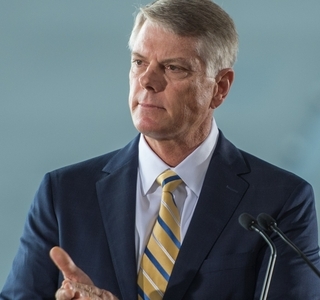 Recently, our Corporate CEO, Mike Petters, announced that not only will we be giving HII employees a one-time $500 bonus in response to the Tax Reform Act; but we will also be investing millions of additional dollars in the communities where our employees live, work and raise their families. We’re doing this because we know that strong communities build great shipbuilders. And we demonstrate that philosophy with more than just dollars in contributions and sponsorships. You will find Ingalls employees – from our executives down to our deck plate workers – volunteering with almost every community services organization in Jackson County, and along the Gulf Coast. From Scouting, to Habitat for Humanity, to the Boys and Girls Clubs, to the Jackson County Animal Shelter … Ingalls employees are committed to making our cities, towns and neighborhoods better places for all of us. In community service, just as in the shipbuilding we do every day, our employees are truly our greatest asset. Currently, Ingalls employees about 11,600 men and women. More than 8,500 of those call Mississippi home. And, off those who live in Mississippi, about 6,200 – more than half of our workforce – live in Jackson County. I’ve been asked before how that impacts our state and local economy. With a weekly payroll of $14.6 million, our annual economic impact on Mississippi is more than $1 billion. On Thursday, about 7,100 employees will receive lump sum checks totaling more than $17.5 million as part of the new collective bargaining agreement approved by our workers in November. In December, they received similar lump sum checks following the ratification of that new agreement. This is in addition to their regular payroll checks. Later this year, Ingalls will celebrate 80 years as a key element of Jackson County’s economy. During those eight decades, nearly 250 naval ships have sailed from our port and into harm’s way. Today, we are laying the groundwork for an equally successful next eight decades and beyond! 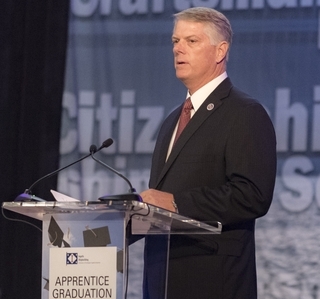 It is truly an amazing time to be a shipbuilder, and I can’t tell you how proud I am to lead this company, Ingalls Shipbuilding … America’s Shipyard. Thank you for your time this morning. May God bless you, Jackson County, and the Great State of Mississippi!